Bionomic - 6500 Series - Wet Scrubber - Jet Venturi Scrubber by Bionomic Industries Inc. The ideal scrubber selection for low to moderate gas volumes when gaseous and or particulate contaminant removal is required. The Series 6500 Jet Scrubber creates its own draft to eliminate the need for a fan in most cases realizing cost savings and system simplification. Inherent with this design, gas is scrubbed with no bypass resulting in a scrubber that can be used for large turndowns in gas flows. The Jet scrubber utilizes a high scrubbing liquid to gas ratio also making it the preferred selection for treating high concentration gas streams to reduce the resultant exothermic reaction temperature rise of the scrubbing liquid. Jet scrubbers are available in single or multiple stages to precisely meet the degree of contaminant removal required. The Jet ejector utilizes a large scrubbing liquid volume high pressure nozzle to aspirate the gas into the unit in a concurrent flow pattern. As the gas enters the throat section, nozzle formed liquid sheets and droplets break up into small droplet sizes due to the reIative velocity difference between the gas and liquid. These extremely small droplets create a tremendous amount of surface area for gas absorption and impaction collection of dusts to occur. Due to the even liquid distribution and large volume of liquid throughout the throat cross section, gas can be scrubbed even at extremely reduced gas rates with no appreciable decrease in removal efficiency. 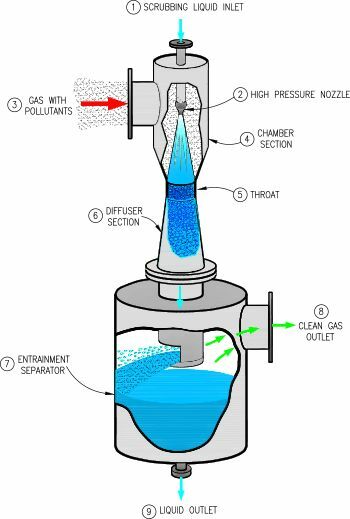 The scrubbed gas with entrained liquid droplets then proceeds out of the throat section into the diverging section of the venturi and into the entrainment removal device or section before the cleaned gas exits the system. For water soluble gases up to 98% in single stage and over 99% with multiple stages. Particulate Removal: 2 microns and above from 95 to over 99.9%. Particulate removal can be increased with multiple stages. Fume emissions from Laboratory Hoods. Toxic, explosive or hazardous gases prohibiting presence of air or oxygen. Emergency vents and gas cylinders. Dust emissions form materials handling conveyors, mixers, bag filling operations. No reviews were found for Bionomic - Model 6500 Series - Jet Venturi Scrubber. Be the first to review!